Astronomy is known for its gorgeous, jaw-dropping images, but why let space have all the fun? This is the first of an occasional series of images from physics research that are thought-provoking, weird, oddly artistic, or just downright entertaining. 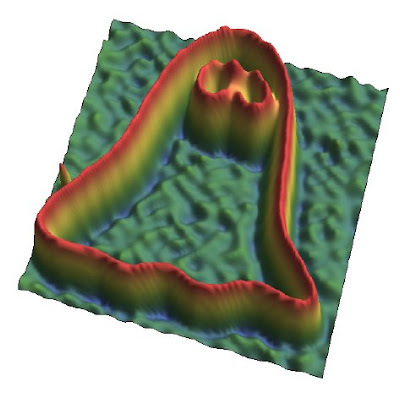 This image comes to us from Barry Jack, a graduate student in physics at the University of Glasgow in Scotland. Jack studies paranormal activity of banshees. . . no, not really. He studies something much more interesting: light. Jack works in optics, he says, because "you can visualize lots of things." "I'm not a theorist or a mathematician," he told me, pointing out that theory can be anything but concrete. "For concepts in optics, it's very easy to create pictures in your mind." Or in the lab, as is the case with this ghost. Jack has pulled off a very clever trick here; he took an image of this wee ghostie using light that had never touched it. How can that be? When we look at, say, the Loch Ness monster, light scattering off of old Nessie's hump travels directly into our eyes. When we whip out a camera to capture proof of the seamonster's existence once and for all, we want light that's bounced off of her to travel through our camera lens, through the open shutter, and onto the film. Until this happens, we'll never be able to prove her existence! But Jack, being a physicist, can't do things like the rest of us. Instead of collecting photons that had actually touched the object, he collected an entirely different set of photons. These hadn't gotten near the ghost, but were connected quantum mechanically with photons that had. This is called, appropriately enough, ghost imaging. While you can make a ghost image with beams of light that are classically related, by splitting a beam, the high-contrast image Jack achieved is thanks to a quantum relation. If you have a best friend or significant other who lives far away, you might sometimes feel like your brains are "on the same wavelength." You find out that you both decided to see the same movie on the same night, or she calls right when you're thinking of her. I roll my eyes when a boyfriend's timely text message makes someone squeal, "We're so in tune!" but this creepy connection we sometimes feel is a good metaphor for the connection between the two sets of photons Jack used in his experiment. Jack took one photon and sent it through a nonlinear crystal, causing it to decay into two photons each with half the original photon's energy. He then diverted one photon so it struck a ghost-shaped hologram, while the other photon traveled unhindered into a detector, in this case an optical fiber. As photon tweedle-dee passes through the hologram (Blinky, Pinky, Inky, or Clyde, you decide! ), features of the hologram change one of the photon's quantum mechanical properties, called angular momentum. And low and behold, away across the room, photon tweedle-dum gets the brainwave too, so that as it flies into the detector it has the same, tweaked angular momentum as its twin. By repeating this with whole beams of photons, Jack was able to get an image of the hologram from photons that had never passed through it, because the information is in the tweaked angular momentum. This is all thanks to the special relationship between the twinned photons: they're entangled. What happens to one happens to the other, no matter how far apart they are. Now there's fodder for your next Valentine. "If I have two [entangled] photons, and I measure one's polarization, that sets the polarization of the other photon, which could be anywhere, on the other side of the universe," Jack says. Apparently Einstein didn't like this idea, which seemed to fly in the face of cause and effect. It also seems to break light's speed limit; a photon entangled with another photon a million light years away will nevertheless change its state instantaneously. But there's a catch. "You still have to detect both photons, so you can't get round relativity," Jack says. 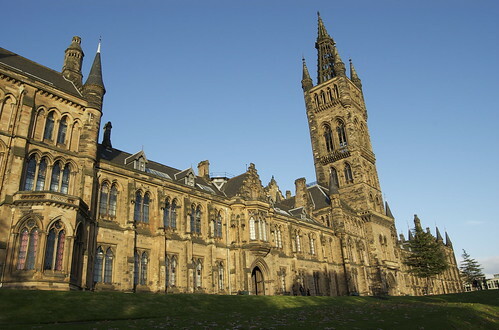 Glasgow University: Haunted by ghostly quantum mechanical effects. Jack, whose Alma Mater city is famously haunted, quips that he should have claimed that the image is proof of a real ghost terrorizing the physics lab. But in that case he'll probably need to make it look less like a Pac-Man character. Thanks to Barry Jack and his optics group at the University of Glasgow for this image, soon to appear with an accompanying research paper in Physical Review Letters. They probably use information readings from both beams (measured state for one, correlated detections from the other) to render the image. In which case there's not much more crazy-quantum-significance here than there is in me "entangling" myself with a friend by verbally agreeing to a passphrase "pinky". Aaaarg! This is the bugaboo of entanglement stories. It isn't in a defined state to begin with, so it can't change. The superposition collapses to a defined state. That's not the same thing. Tom - an excellent point. Being the expert here, Barry doesn't make the mistake I do; he says, "I measure one's polarization, that sets the polarization of the other photo." The key word here is "sets" - as you point out, the photon is in a superposition of many different states until the moment when we measure it. I mistakenly use the words "change" and "tweak," which implies that the photon's angular momentum is set from the get-go. Thanks for the much-needed clarification. Anyone know of a good web resource (besides wikipedia) that explains this? Angular momentum of 'twin' photons seems more like a statitical possibility, especially when you consider both sides of the Big Bang. Trying from greater distances should give room for a "miss fire" in symetery. Higg's particle has to make thoughs tweeks. Pinky and Clyde(in slow motion) must show a beautiful walts. At least in the begining.